Steptember | Don’t Circle the Block – Park and Walk! 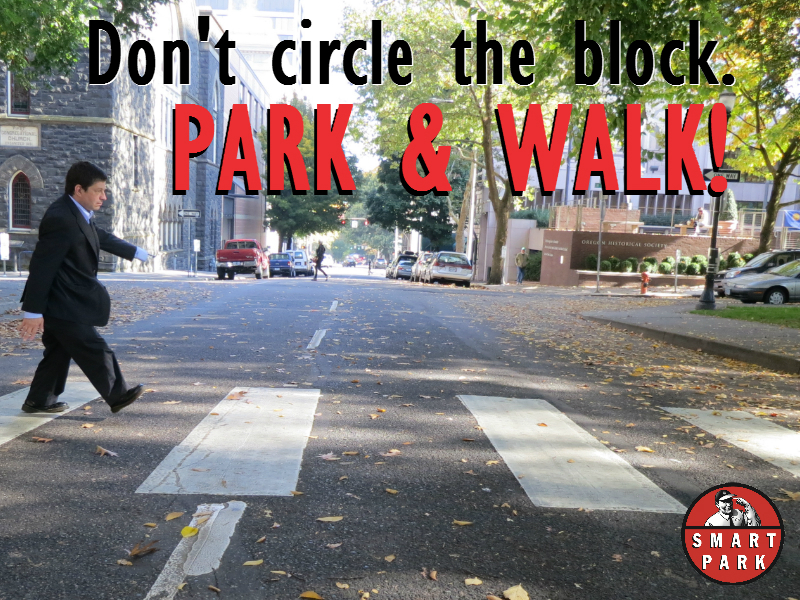 Don't Circle the Block - Park and Walk! Thursday, October 24, 12:00pm - 1:00pm. Gather beginning at 11:45 a.m. The walk steps off at 12:05 p.m.
Join City Commissioner Steve Novick for a lunchtime Walktober event highlighting how each of us can reduce traffic congestion and air pollution while improving our health. So when we park early and walk, we’re getting healthier. And in turn, we’re cutting down on traffic and pollution, and can even save a bit of time. Now that’s a win, win, win. One way to avoid circling is to simply head to a garage. In downtown Portland, SmartPark is Portland’s most affordable and conveniently located parking, offering nearly 4,000 spaces and the lowest short-term hourly rates. Commissioner Novick will lead a lunchtime Walktober tour of SmartPark garages located in downtown. The walk steps off at 12:05 p.m. on Thursday, October 24. Meet on SW 4th Avenue between Yamhill & Taylor, near the SmartPark entrance! Discussion and opinions about parking policy are welcome. Wonk Walk 2013: Crosswalk Crusade! I too have a pedometer and noted our Walktober event connecting four SmartPark garages meant 2300 additional steps for me…the prior day I logged a total of 4800 so you can see this was half my lazy Wednesday. Also I got both Katie Shriver’s and Casey Ogden’s autograph! How cool is that!